After weeks of uncertainty and speculation, it seems that Peyton Manning has made his choice to join John Elway and the Broncos for the next phase of his impressive career. Denver managed to beat out San Francisco, Tennessee and others for the quarterback's services despite many questioning whether it represented the best fit. While the decision has not been finalized, all signs point to a quick deal. The discussion now turns to what hobby implications this change of scenery will have on Manning and the rest of the players involved, including fan favorite, Tim Tebow. Peyton Manning has already established himself as a top quarterback capable of turning a franchise around and making the players around him better. Although many expected him to retire as a member of the Indianapolis Colts, neck injuries forced him to miss the entire 2011 season. When the Colts sputtered through the season without Manning, the possibility to select the next franchise quarterback became a reality. The Colts cut Manning to make way for the likely first overall pick, Andrew Luck. This gave a glimmer of hope for all the NFL teams without strong quarterback options. Manning is already a mainstay in the hobby and simply changing teams will likely only boost his values in the Denver area. Collectors and fans alike will be waiting to see how the rehabilitated quarterback holds up and if he still has the ability to play for a few more years. Assuming Manning has healed properly, he should bring an elite caliber of play to Denver and the AFC West. 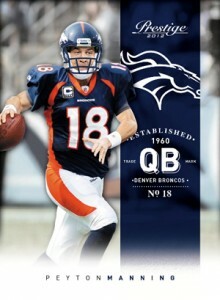 However, because of the injury, Manning's cards and memorabilia values have dipped in recent months. As a result, there is room for growth. That being said, Manning spent many years in Indianapolis bringing the Colts deep into the playoffs. In order to see significant increases other than a rebound to pre-2011 levels, he will need to build on that. Unless he can add another Super Bowl victory to his résumé, it is hard to view Manning as a great long-term investment opportunity. The next big domino in the move is Tim Tebow. It would be great for the Denver fanbase and Tebow if he stayed in Denver and learned under the tutelage of Manning. However, the more likely scenario has Tebow moving elsewhere. For some players, losing the starting spot might mark the end of a career but Tebow is not just any player. If anything, this will likely add more to the Tebow saga that is already filled with tales of perseverance and overcoming adversity. Collectors flocked to the young player once he took over the starting job in Denver and the bandwagon kept building as he led the team into the playoffs with one dramatic win after another. Although it is early in the process, one of the top teams mentioned as a landing spot for Tebow continues to be Jacksonville. Tebow's rabid fanbase from his days at the University of Florida would love to have him back in-state and many of the legions of fans he has gained during his two seasons with Denver would likely follow him. After what happened last season, it's hard to imagine "Tebowmania" growing any larger. Collectors who believe Tebow represents a long-term solution at quarterback should invest now before another explosion in demand for Tebow happens. A trade to Jacksonville would also have implications for the current quarterback, Blaine Gabbert. Gabbert attracted the attention of many collectors based on his high draft spot and prolific numbers while at the University of Missouri. Unfortunately, Gabbert posted one of the worst rookie seasons in recent memory and was labeled a bust by many. Even without Tebow in the mix, Gabbert may end up losing his starting spot to newly signed free agent, Chad Henne. There are several other players to keep an eye on from a hobby perspective but none call for immediate action. Basically, anyone on the Denver offense could see a "Peyton bump" in production and collecting interest. Knowshon Moreno, Willis McGahee and Eric Decker could all see solid increases. From an investment standpoint, Demaryius Thomas represents the best option. Obviously, many things can and will change between now and the beginning of the 2012 NFL season, but it certainly is a situation worth monitoring. 2008 EXQUISITE COMBO PATCH #ECP-6 PEYTON & ELI MANNING (1 1) ONLY 1 IN 🌎!! !